KTA is the seventh oldest honor society in the United States and was founded in 1910 at the University of Missouri, the first school of journalism in the world. Inductees received a certificate and pin. Graduating seniors also received a medallion and honor cords. Inductees recited a pledge to the highest ideals of journalism and mass communication and to free speech, skill, honesty, fairness, accuracy and truth. Senior inducted include: Ayanna Fields, Joseph Gaither, Moriah McLain, Arriana McLymore, Hayley Myles and Briana Oates. Juniors inducted include: Alexis Anderson, Chental Song Bembry, Alexandra Carmon, Ania Cotton, Jarrell Dillard, Maya Gray and Kandis Mascall. 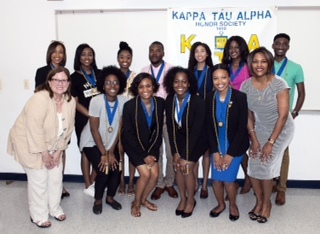 Current members include: Krystyn Beecher, Sydney Bland, Ricci Bostick, Nyaa Ferary, Malik Jones, Darryn Mumphrey, Christina Powell and Aliah Williamson. The KTA advisor is Prof. Lynn Waltz.